Along with the other new E-Bodies, the 1979 Oldsmobile Toronado was smaller and more space and weight efficient than the earlier models. Even though it's occupancy went from six passengers to four, it offered more interior space per passenger than the older, larger versions. With the smaller 350c.i./5.7L engine as the largest of the engine options, it still was able to give a good performance package that was acceptable for it's weight and size. An Oldsmobile-built 350 cubic inch V-8 diesel engine was also available, but some owners reported difficulty starting it, and other mechanical issues plagued it to the point that it developed a bad reputation for reliability, and used Toronados with diesel engines had lower book values than those with gasoline engines. New innovations included independent rear suspension which improved handling and preserved a smooth, comfortable ride. Styling changed very little during the 1979-1985 era, with the 1979 models the easiest to spot due to their different front end styling. The grille featured an egg crate pattern that was 5 high and four across, with Toronado spelled out just above the top openings. This left a somewhat tall nose area above the grille, giving the car a powerful appearance. Rectangular headlights with turn signals just below were slightly recessed from the center hood bulge and front fender edges. Linear taillights in back gave the Toronado a continuity of appearance, although the 1979 design was simpler than before. In profile, the front end was blunt and the rear sharply angled. The rear roofline was almost vertical, and Toronado's typical open wheel wells gave the car a sporty flair. Inside, a new instrument panel design gave the interior a spacious look, controls were positioned for clarity and vital controls were within an arm's reach of the driver. 1979 the Toro production moved out of the Lansing, Michigan Olds plants to Linden, New Jersey, where the car was built on the same assembly lines as the Buick Riviera and Cadillac Eldorado. Changes to the 1980 models would be minor. A new grille consisted of 3 horizontal slots that ran from fender to fender, concealing the new parking lamps and turn signals, which were taller than last year. 1981 models would use the same grille. A new 5.0 Litre, 307 cubic inch V-8 became the new standard engine. It generated less horsepower than the optional 350, but fuel economy was better. New features for 1980 included a side frame jacking provision, a design which was shared with other Oldsmobiles for 1980. Halogen high beam headlights were standard, providing a brighter, whiter light than conventional sealed beam headlamps. A new XSC trim package included high back bucket seats and console, a leather wrapped steering wheel, a gauge package, firm ride and handling suspension, color-keyed sport mirrors and wheel discs, body accent stripe, and XSC nameplates on the sail panels. Interiors were available in just two colors, Claret (dark burgundy) and Silver. 1981 is notable for the fact that a V6 engine was standard equipment. Buick's 4.1 Litre 252 cubic inch engine was not popular due to the fact it seemed a bit anemic in the somewhat heavy Toronado. The 307 introduced as standard in 1980 was now optional, and the gasoline 350 was discontinued. An attractive optional aluminum sport wheel was introduced in 1981, and was only available for one year, making them very rare today. Buyers could no longer get a full vinyl roof, the Landau style roof was the only one offered. Inside, the seat upholstery sew pattern changed from a biscuit pattern to a ribbed one. For 1982, the XSC option was dropped as were the aluminum sport wheels. Changes were minimal, but included a new grille design with five thin horizontal slots, separated by fine chrome bars. New standard features included cruise control and a tilt steering wheel. Rear disc brakes and a 4-speed automatic transmission were also provided as standard. Inside, the instrument panel was revised to allow for a new generation of Delco electronically tuned radios which included digital clocks. A driver's side power memory seat was a new option, which allowed multiple drivers to program the most comfortable seat position, and restore that position at the touch of a switch. Very few changes differentiated the 1983 models from the previous year. Up front, the Toronado nameplate moved from the header panel above the grille on the driver's side to the grille itself. A Toronado "T" crest emblem was mounted at the center of the header panel. GM worked in concert with Bose to create a new line of Delco/Bose sound systems, which featured individually-amplified speakers tuned to provide the best sound quality for each specific car interior. A new grille and a luxurious new trim package greeted 1984 Toronado buyers. The new grille featured a body-colored horizontal bar that split the grille lengthwise. Smaller chrome bars ran horizontally above and below the body-colored bar. The new Caliente (RPO WJ8) trim package featured distinctive touches inside and outside to set it apart. A brushed metal strip appeared as a grille header, and was duplicated on the lower edge of the trunk lid. Heavy brushed metal side moldings ran from the tip of the front fender to the rear edge of the rear quarter panel. 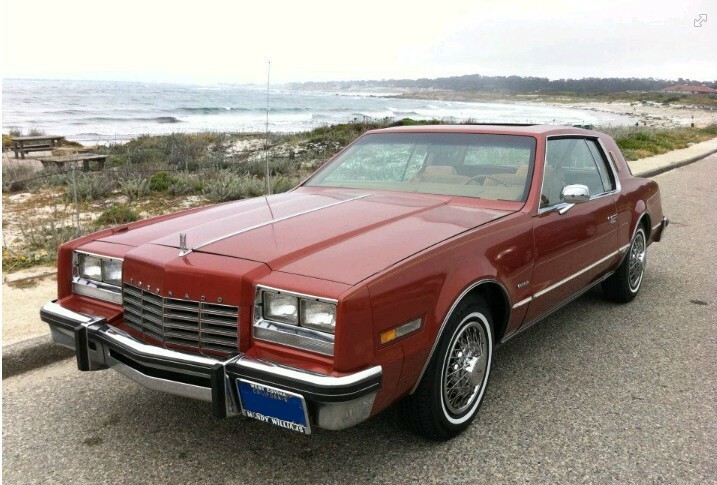 A heavily-padded Landau vinyl roof with brushed metal wrapover molding and Caliente nameplates just behind the rear side glass made this trim package stand out, as did the wide polished stainless rocker moldings that ran between the front and rear wheel openings. Inside the Caliente, leather upholstery was standard as was the new vacuum fluorescent digital instrument cluster, an option on other Toronados. If leather wasn't your thing, lamb's wool shearling inserts were available as an option on the Caliente. A new electronic day-night rear view mirror was offered, which featured a motorized base that would tilt the mirror when headlights from behind created glare. In its final year of this body style, the 1985 Toronado was little changed. The grille received an updated appearance with a fine egg crate design. A small Toronado nameplate was mounted on the lower driver's side of the grille. The unpopular 4.1 V6 engine was discontinued, and the 307 V-8 would again become standard with the 350 diesel V-8 remaining as the sole option. 1985 would be the final year for a Toronado powered by a V-8 engine, and it would also be the last time full frame construction was used by GM on a front wheel drive car.